New: 3/2019 ThriveNYC White Paper, 3/19 Daily News op-ed on ThriveNYC, 3/19 NY Post op-ed on ThriveNYC 4/18 Our NY Post op-ed on Brooklyn shooting…. 1/2018: New data on Kendra’s Law shows outstanding results. We respond in Daily News and in City Journal to Cuomo’s statement on mental illness. …Oped in Daily News on police training….Excellent Manhattan Institute Forum on Serious Mental Illness (video). DJ Jaffe on NY-1 on Kendra’s Law…. Kendra’s Law (New York Mental Hygiene Law § 9.60) allows courts to order certain individuals with serious mental illness to stay in treatment for up to a year while continuing to live in the community. 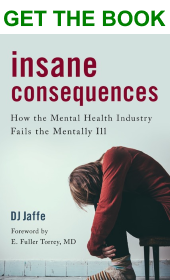 Simultaneously, the court orders the mental health system to provide the treatment, thereby overcoming its reluctance to serve the most seriously ill (cherry-picking). The generic name for Kendra’s Law is “Assisted Outpatient Treatment” (AOT). It is less restrictive, expensive and more humane than the alternatives: inpatient commitment or incarceration. It is only for those seriously mentally ill who already accumulated multiple episodes of homelessness, arrest, incarceration or hospitalization due to their failure or inability to stay in treatment that was offered to them voluntarily. Multiple individuals and organizations are authorized to start the process by filing a petition with the court. A hearing is held where the patient has a lawyer. The court can order an examination of the individual. i. a substantial risk of physical harm to the consumer as manifested by threats of or attempts at suicide or serious bodily harm or conduct demonstrating that the consumer is dangerous to himself or herself, or ii. a substantial risk of physical harm to other persons as manifested by homicidal or other violent behavior by which others are placed in reasonable fear of serious physical harm. What services are included for how long? Individualized treatment plans are prepared. Everyone in Kendra’s Law is mandated to have a case manager to monitor their compliance with treatment. Non-compliance can trigger an investigation to determine if the individual needs inpatient evaluation or commitment. Medications are included in most treatment plans. Other services can include substance abuse counseling, individual or group therapy, day treatment, educational or vocational training and other services appropriate to the individual. The court order is for no longer than 12 months and can be renewed if needed. AOT was proposed in 1989, by families of people with serious mental illness who wanted better treatment for their relatives. In 1994, NYS started a Pilot Program at Bellevue Hospital in NYC. In August 1999, when Kendra Webdale was pushed to her death in front of a subway by someone with untreated mental illness, the public recognized that AOT not only helped people with mental illness, it could increase public safety. NYS fixed some of the problems with the Bellevue Pilot Program and enacted “Kendra’s Law.” It sunsets in 2017 unless renewed or made permanent. Cracks in Kendra’s Law have been identified that need closing. The Kendra’s Law results have been outstanding. This is good news because Kendra’s Law serves only the most hard-to-treat individuals. Studies show that individuals under Kendra’s Law orders, despite greater histories of violence, were four times less likely to engage in future violence than those in a control group. Kendra’s Law reduced homelessness (74%); suicide attempts (55%); and substance abuse (48%). It keeps the public safer by reducing physical harm to others (47%) and property destruction (43%). It reduces hospitalization (77%); arrests (83%); and incarceration (87%). Studies show Kendra’s Law causes no increase in perceived stigma or coercion, and that the court orders themselves (not just the availability of high-quality services) are instrumental in the program’s success. By reducing incarceration and hospitalization, Kendra’s Law saved taxpayers 50% of the cost of care. Why should we have Assisted Outpatient Treatment (AOT) laws? For those who suffer from an untreated severe mental illness, time is brain. With each psychotic episode they lose the brain cells they will need to recover with. Some seriously ill have anosognosia, (possibly a brain malfunction in the frontal lobe) that prevents them from recognizing that they are ill. Instead of ‘knowing’ they are ill, they may ‘know’ they are the Messiah, or “know” the FBI planted a transmitter in their head. They are unlikely to volunteer for treatment on their own. Treatment can restore their insight and restore their ability to voluntarily engage. Kendra’s Law is not an alternative to community services, it is a way to see those services get utilized by those too sick to voluntarily access them. 2018 Kendra’s Law results are in!